South African front of house engineer, Marius Marais, has long been a user of HARMAN’s Studer and Soundcraft mixing consoles. 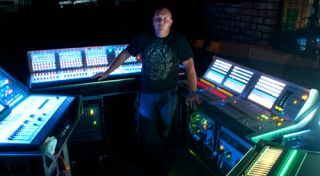 Recently, he has increased his inventory, adding a Studer Vista 5 SR, a Soundcraft Vi1 and Si Compact (with optical card)—all supplied by HARMAN Professional’s South African distributor, Wild & Marr. The sound engineer’s induction to the Soundcraft family took place with the launch of the Spirit Live 4, when the Freestate Performing Arts Council bought one to use on a township outreach arts program. When Marais joined audio rental company Sound Stylists in 1997, he worked on a Soundcraft SM12 and later a Soundcraft Series 5 and Series 5M. By 2009, Marais had formed his own company, Audio Logic, with Wild & Marr providing an Si3 which he used as a sidecar (alongside the Vi6) for big orchestra shows involving the giant Afrikaans music production, “Skouspel” (which translates to “Spectacular”). This included a 64-piece orchestra, a 6-piece rhythm section, a guest band of various sizes and numerous vocalists.